You can't copy an encrypted AMI that was shared with you from another account. You can't copy an AMI with an associated billingProduct code that was shared with you from another account. This includes Windows AMIs and AMIs from the AWS Marketplace. 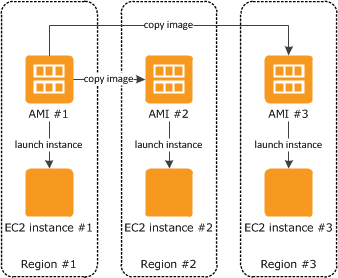 To copy a shared AMI with a billingProduct code, launch an EC2 instance in your account using the shared AMI and then create an AMI from the instance. For more information, see Creating a Custom Windows AMI. Create or obtain an AMI backed by an Amazon EBS snapshot. Note that you can use the Amazon EC2 console to search a wide variety of AMIs provided by AWS. For more information, see Creating a Custom Windows AMI and Finding a Windows AMI.